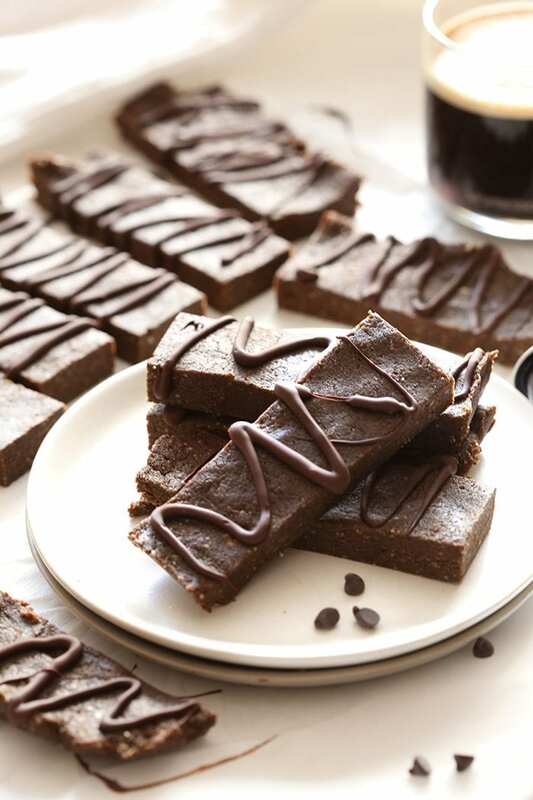 High-quality protein powder, combined with delicious espresso make these Healthy Mocha Protein Bars your new go-to snack recipe. They’re easy to whip up, made from simple ingredients and are perfect to throw into your bag for life on the run. I have a weird relationship with protein bars. In theory, I’m not the biggest fan of using protein powders to replace other whole-food proteins in your diet. In reality, life is far too hectic too hectic to casually whip up a grilled chicken breast or hard boiled egg. I’d rather have a healthy protein bar ready to go rather than bank on having time to make a healthy snack. And let’s be honest, I’m barely home enough for that to be a possibility. So protein bars are kind of my jam. Bars and balls are my go-to on-the-run snacks and if you were to open up my purse right now you’d likely find at least two varieties. 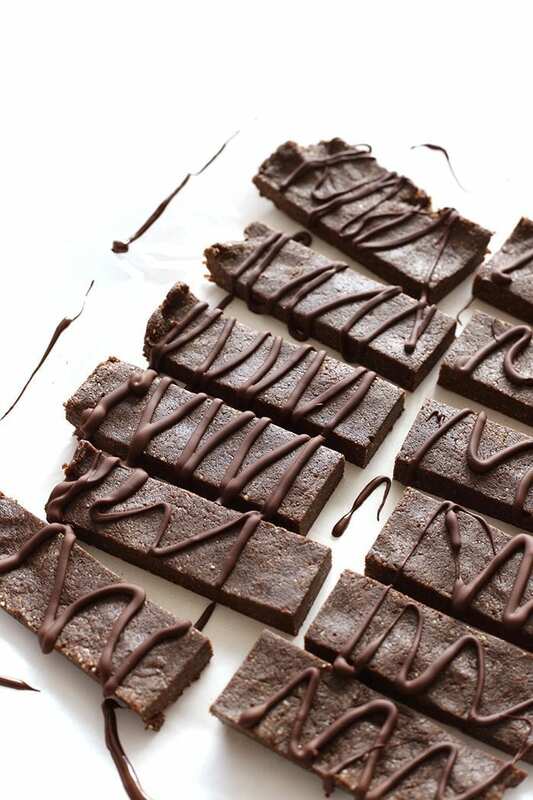 If you struggle with “hanger”, I highly recommend whipping up a batch of these Mocha Protein Bars on the weekend to snack on through the week. This certainly isn’t the first and definitely won’t be the last protein bar recipe around here. 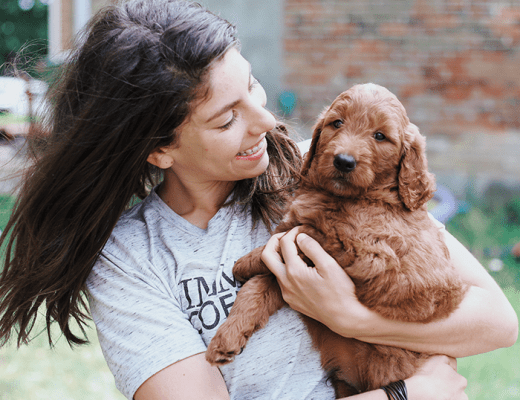 I oftentimes find myself reaching for my Cinnamon Roll Protein Bars or Almond Joy Protein Bars, but have been feeling like I needed to change things up. 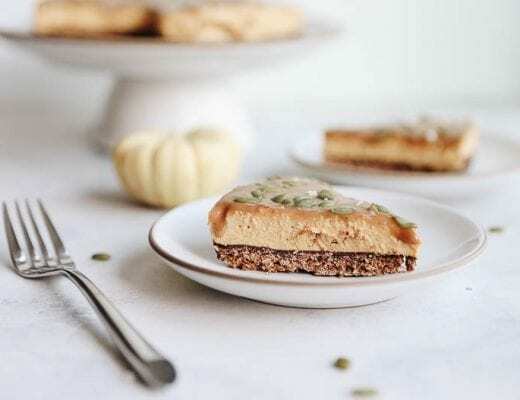 The idea for these mocha flavored bars came from a session we had with a coffee sommelier at the Nespresso booth at The Rogers Cup in Montreal. 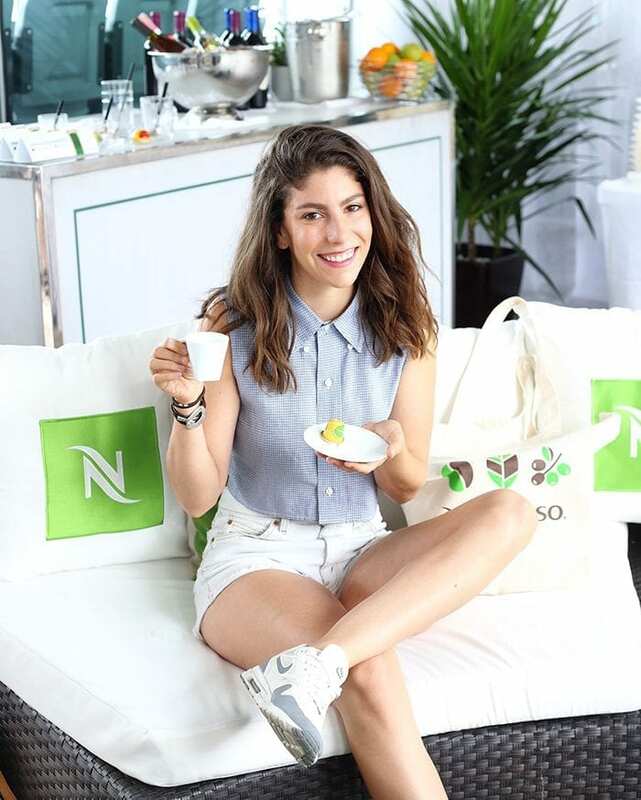 Nespresso invited their coffee connoisseurs to come meet Elyse Lambert (a coffee sommelier) to learn more about coffee pairings and enjoy some tennis. With so much coffee around, the tennis was a total after-thought for me though. I was all about the coffee! One of the main things I learned was how to really bring out the flavors of the beans by pairing the coffee with specific foods. I can’t say I’ve ever slurped, smelled and paired coffee before but it was amazing the depth of flavor you experienced when you’re taught how to really sense and taste the coffee. And not surprisingly, coffee + chocolate makes a pretty epic combo! It was such a blast to meet the whole Nespresso team (who not surprisingly are all amazing!) and learn even more about my favorite hot beverage. 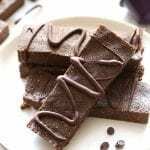 And now I have an even more amazing way to enjoy your morning cup of joe, with these Healthy Mocha Protein Bars! I mean healthy coffee protein bars? Sign me up! Add dates to a food processor or high-powered blender and process until broken down into pea-sized pieces. Add in nuts and continue processing until nuts are also broken down into pea-sized pieces. Add in protein powder, espresso and sea salt and process until all ingredients have been completely broken down and combined. Dough should be powdery but sticky if pressed together. Add in non-dairy milk, 1 tbsp at a time until dough comes together into a sticky ball. You don’t want it to be too wet though. Line an 8 x 8 inch baking sheet with parchment paper and press dough into pan, firmly until totally flattened across the top. Place in freezer to set for 15 minutes. 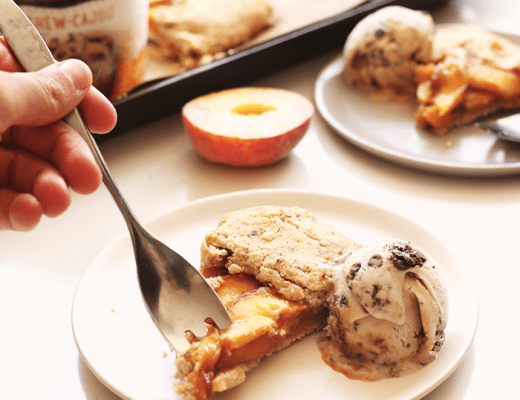 Remove from freezer and cut into 12 bars. Melt chocolate chips in microwave and then drizzle chocolate over bars. Store in the fridge for up to 2 weeks or longer in freezer. great idea on the OO! 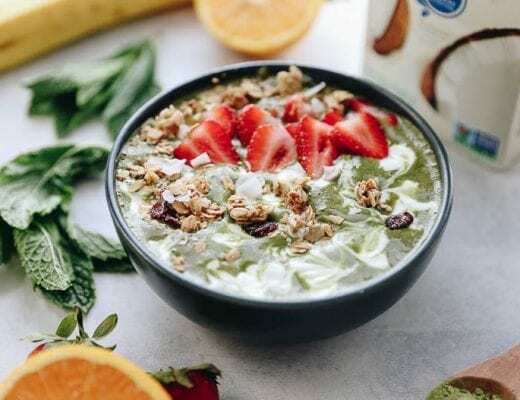 I’ve been making smoothies with protein powder and it really does help keep me fuller for longer! I expect as least one of these wrapped up in a cute little baggie for me on Friday. Plz. Thx. I expect a whole new wardrobe in return…oh wait. You’re looking like quite the model lately, my dear. You know my obsession runs real deep with your mint choc protein bars so I’m sure these will be no different! Coffee and chocolate is one of my favorite combos! I always keep a few protein bars with me when I’m on the go, but prefer making snacks at home from my own ingredients. Yup! Same here. If I can find the time, it’s so worth it! Espresso powder, I’m in! These sound super tasty. I agree, as much as I try to avoid protein bars and packaged snacks… I don’t leave home without food in my bag! Haha. Seriously you’re too adorable in that pic at the Nespresso event! And these bars; I gotta try! Sounds delicious! Can these be made with liquid espresso or only instant coffee or ground coffee? Thanks babes! Wouldn’t recommend using liquid espresso as it will really throw off the texture! Ah, protein bars were an old favorite too (ahem, Quest bars!)! I do agree that these are so much better for you–any whole protein foods are ideal! These sound delicious. I normally hate protein powder in smoothies so I’m trying to find ways to eat it other than smoothies. I have a couple of questions. Can I use 1 tbsp espresso powder instead of the Nespresso OriginalLine Cafezinho Capsule? I think that’s what the star was for but I couldn’t tell. Can I use regular milk and regular chocolate chips in place of the non-dairy ones?